High quality alloy steel carburised to a surface hardness of HRC58-62. Precision ground for parallelism and squareness to a high finish. The angled locking screw design completely eliminates jaw lift. Spring loaded mechanism for fast clamping. The sides of the larger Type 2 precision tool vices are slotted for easy clamping. Prismatic moveable jaw with 1 horizontal and 1 vertical vee for holding round bar. The fixed jaw has a threaded hole at each end to facilitate the fitting of an end stop. 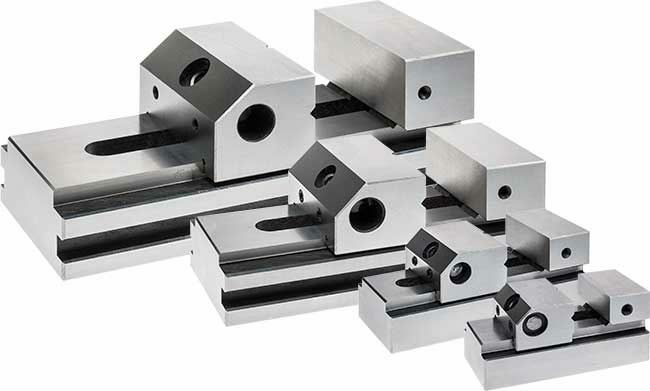 The Type 2 Precision Tool Vice uses a similar rack and pin-block locking method to our Type 1 precision tool vice. The main difference is that 3 springs help to keep the pin engaged in the rack. This is helpful when adjusting the jaw opening since the moveable jaw automatically slides back when loosening the locking bolt instead of the pin-block dropping out of the rack. 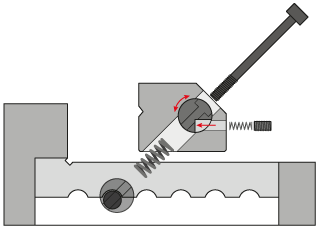 The locking screw pulls on a pin-block which is engaged in a rack machined into the body of the vice. The springs make opening and closing easy. To re-position the pin-block to a different location on the rack, use an hex key to increase the angle of the locking bolt to drop the pin-block out of the rack, then move the jaw and re-locate the pin block. Tip: Try to avoid unscrewing the locking bolt from the pin-block completely; the springs make the task of re-assembly just a little more tricky. The rack allows the movable jaw to be re-positioned whilst keeping the locking screw at an optimum clamping angle.